Here are some concepts for the bosses I will add in future updates. The first boss will be a "Gnome Chieftain" that rides on an armored eagrett (gryphon). Aside from different attack patterns with his throwing axe, he can also summon gnomes to keep the players in their toes, The second boss (not pictured) is going to be a giant insectoid called "Waspis Queen". It will also have various attack patterns with various skills like a melee blade attack, ranged blade attack, acid spit, and summoning waspis drones. 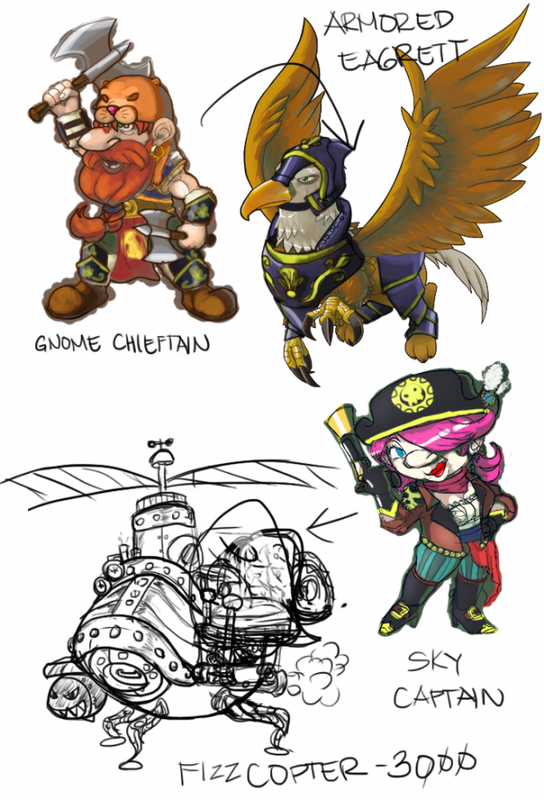 The last boss I have in mind is the "Sky Pirate Gnome". This one will ride on a steampunk inspired aircraft and will have various attacks like missiles, etc. Basically boss fights should play like SHMUPS with less mobility for the player.